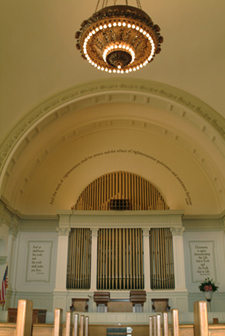 Our pastor consists of the Bible and Science and Health with Key to the Scriptures by Mary Baker Eddy. Central to all these churches is the Bible including the word and works of Christ Jesus. Numerous resources commemorate his legacy including the Weekly Bible Lesson, Sunday services, Wednesday evening testimony meetings Reading Rooms and lectures. Understanding Christ Jesus’ message blesses and regenerates lives. It heals. This church is here to support anyone who wishes to explore the life and love of the master Christian as elucidated by Mary Baker Eddy, the discoverer and founder of Christian Science. Going south on I-75 you take the TECHWOOD DR/10TH/14TH STS exit, exit #250. Turn left. Continue on 14TH ST to PEACHTREE ST NE. Turn left. The Church is one block north on the right. Going south on I-85 you take the GA-13 SOUTH/PEACHTREE ST exit, exit #86. You continue on the exit for appx. 3 miles. As the exit ends keep to the left. The second traffic light is PEACHTREE ST NE. Turn right. Continue south to 15TH STREET. The Church is on the left. Going north on the I-75/85 Connector take the 10TH STREET exit, exit #249B. Turn right onto 10TH STREET going east. At PEACHTREE ST NE turn left (going north) continuing to 15TH STREET. The Church is on the right. There are two parking lots behind the Church and on Sunday parking is available in the Carter Building parking lot.